With Remote & Timer The new 50 watt Flybird Solar Street Light is great for commercial use! 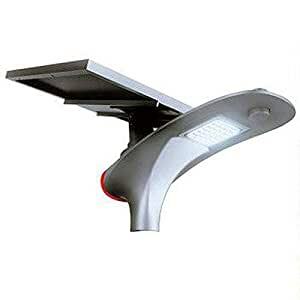 Get commercial grade solar powered street and parking lot lighting at a fraction of the cost of traditional electric installation. If you’re worried about power, don’t be! This light is equipped with cutting edge LiFePO4 battery technology which was specially designed for high power applications and provides a long battery life with high discharging current. Brightness isn’t a problem either with its 6500K LED lights which put out 3000 lumen of super bright solar powered illumination. Forget high electric installation fees – go solar today and save tons on energy costs! Product Specifications: 1 Year Warranty, 3000 Lumens, LiFePO4 Battery, Panel Measurements are 28″ x 26″, Light Measurements are 25″ x 12″, Remote Operation Included, Mounting Hardware Included, Pole Not Included.